Louisa Neill’s tiny ceramic sculptures seem to exemplify the aesthetic of “Quietly Powerful,” a multimedia Sense Gallery show that features more than 30 artists. Neill’s wall-mounted boxes are partly filled with miniature sticks and slabs, made of the same material and apparently movable. Austere yet toylike, the pieces are an exercise in dollhouse minimalism. Equally delicate are several works that evoke nature without explicitly depicting it, notably Trenton Jung’s set of small botanical abstractions and Dianne Szczepaniak’s watercolor in shades of yellow, as if the paper has been stained with flower petals. Not all the art is so tranquil. Tory Cowles dominates a corner of the room with a towering assemblage of steel and wood whose jagged pinnacle gnarls toward the ceiling. In a selection devoted to “introverts” — according to a gallery note — this sculpture is confident and outspoken. Cowles’s creation shares with several others a reliance on found objects. Dainty plaster pieces by Amanda Muhlena Hays center on apple seeds, Mills Brown plants a fallen bird’s nest amid a flowery collage and Noel Kassewitz incorporates rope, floats and a buoy into a nautically themed fabric piece. Such works may be hushed, but they evoke a big, noisy universe. Sense Gallery is pleased to present the solo exhibition, Katie Pumphrey: Merry-go-round, on view February 2 — 28, 2019. The opening reception for the artist will be held on Saturday, February 2nd from 6:00 – 9:00 pm. There will also be a closing reception on Wednesday, February 27th from 6:00 – 9:00 pm. Both receptions are free and the public is warmly invited to attend. There will also be an Installation Performance event Saturday, February 9th from 2:00 – 6:00pm, during which the artist will be changing the site specific installation made of paper. This event is also free and open to the public…..
Portraiture is the focus of “Eyes Open,” the six-artist show that introduces Sense, a new gallery above a hair salon of the same name. The array was curated by Rose Jaffe, who included several of her own works, including some made in collaboration with Jordan Sanders. A few of the subjects are well known, but many seem to be mythic or fictional. Esteban Whiteside includes Malcolm X and President Trump in a painting he calls a self-portrait, and a graffiti-inspired artist who goes by the tag Absurdly Well jumbles an image of White House press secretary Sarah Sanders with stenciled text, spray paint and glitter. Yet Whiteside’s most expansive picture offers multiple versions of Michelangelo’s David, and some of the other subjects appear to be fantastic beasts. Marie Amegah’s computer-generated illustrations integrate decorative patterns into portraiture, while Ann Gill goes 3-D in drawing-painting on multiple layers of paper. Jaffe’s work is often rendered with simple outlines, yet also resists flatness: Her brightly hued pictures are mounted away from the wall, and her profiles of faces in steel are free-standing. In “Eyes Open,” facial features are less important than color and shape. 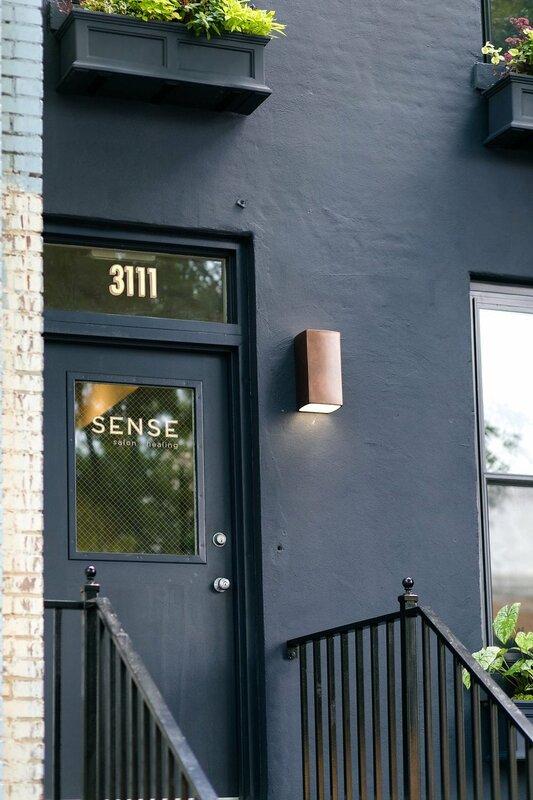 On Friday, Erin Derosa will open the newest addition to her Park View hair salon Sense — an art gallery. The space will open at 7 p.m. Friday with a reception for “Eyes Open: DC Artists in Real Time,” an exhibit curated by veteran D.C. visual artist Rose Jaffe. “Eyes Open” features works from several emerging talents who explore the realities of being an artist in the city. The show includes a performance from avant-garde R&B singer-songwriter Twin Jude. 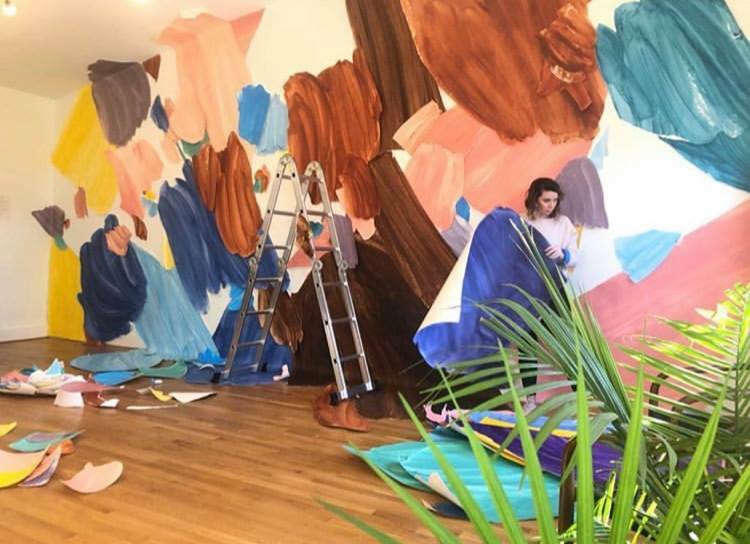 The gallery feels like a natural extension for Sense, which has embraced a community-oriented business model as a hair salon and wellness center that offers workshops on career coaching, breathing exercises and more. Derosa tapped artist Mandy Cooper to curate Sense’s space earlier this year, and Cooper proposed the gallery right before the salon’s opening in August. “When I saw the upstairs, I thought, ‘Oh, my gosh, it would be a crime to not use this space, because it’s gorgeous,’” Cooper says. Cooper expects to showcase mostly regional artists and plans to host live performances and community events at the venue. “We want to get people into this space, [let them] see what we have to offer and communicate with them about our open calls,” Cooper says. Local artists can submit proposals to be considered for future exhibits, and all of the artwork at Sense is available for purchase.